Explanation: For 55 consecutive nights Mediterranean skies were at least partly clear this summer, from the 1st of July to the 24th of August 2018. 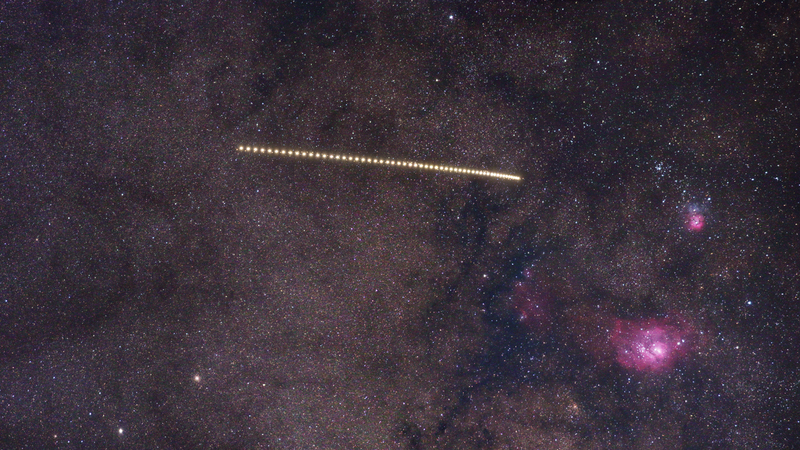 An exposure from each night was incorporated in this composited telephoto and telescopic image to follow bright planet Saturn as it wandered through the generous evening skies. Through August, the outer planet's seasonal apparent retrograde motion slowed and drifted to the right, framed by a starry background. That brought it near the line-of-sight to the central Milky Way, and the beautiful Lagoon (M8) and Trifid (M20) nebulae. Of course Saturn's largest moon Titan was also along for the ride. Swinging around the gas giant in a 16 day long orbit, Titan's resulting wave-like motion is easier to spot when the almost-too-bright Saturn is digitally edited from the scene.